and there it was: a confluence of forms. 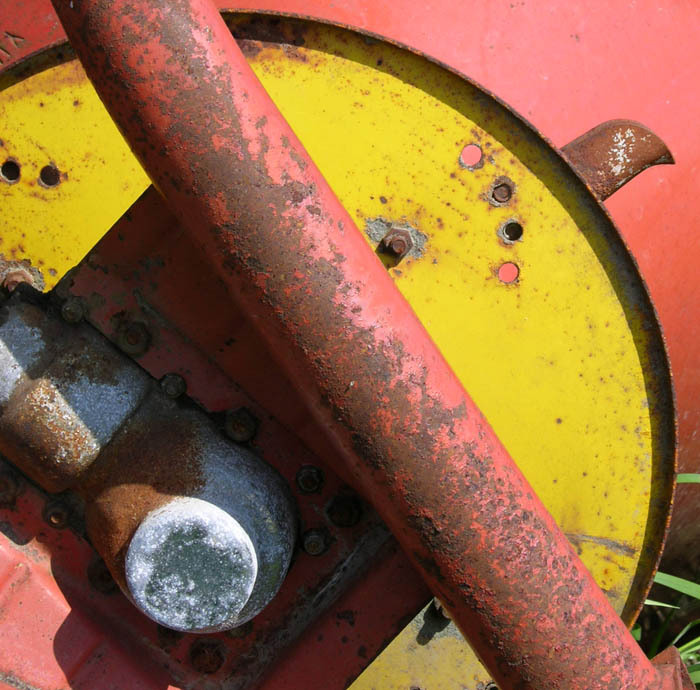 I see that little fillip on the upper right as an organic addition, a little creature inhabiting the machine. 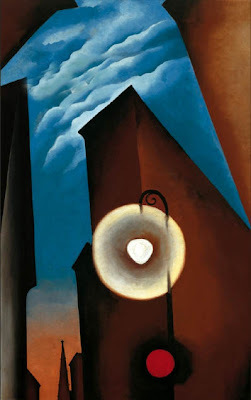 I have previously written a post on Charles Sheeler, an American precisionist painter whose work I greatly admire; I also feel a kinship, as an American and a painter of machinery in whose forms I try to find abstract elements, to other American modernist painters. So I thought I'd present a few paintings of this era as an homage to their pioneering work of the early 20th century. The New York art world busted loose of convention, found itself intensely shaken, by the Armory Show of 1913, which first exhibited modern European painters such as Picasso, Duchamp and Matisse alongside American artists. 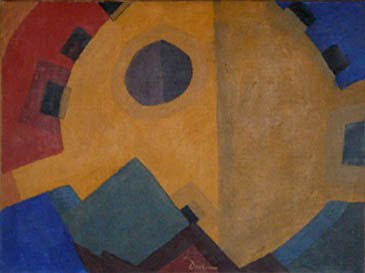 Here is an excellent site to guide you through that show, which opened America to modern abstract art. It was the beginning of a move from Impressionism and the Ash Can School to a new way of seeing, based on Cubism. These two works, by Charles Demuth and Louis Lozowick, both in the collection of the Metropolitan Museum of Art, exemplify a focus of American painters: looking at the overlooked parts of our world related to industry and modern life. They went up to rooftops to gather images of things not usually seen, making them dramatic characters on the artistic stage. Demuth uses line and flat forms to abstract his objects, while Lozowick simplifies; both animate the objects: Machinery with undulating arms and Roofs and Sky by creating an intense sentinel presence, as though Darth Vader had landed on a NYC roof. 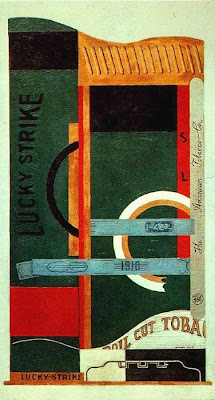 The work of Stuart Davis seems to me to be very close to that of European modernists, especially cubist collage, in his use of text and objects of ordinary life. His paintings are more akin to jazz, with their bright colors and rhythms. 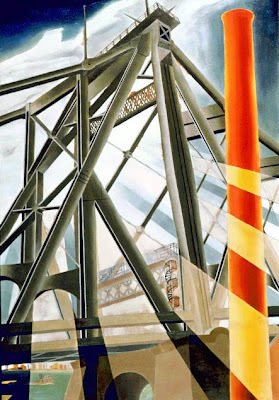 Elsie Driggs was considered a Precisionist, along with Sheeler, Demuth, Lozowick and others, who saw industry as a positive force in modern life and a essential subject for painting. They used differing levels of abstraction, generally with clearly defined edges of forms, hence the "precision". Sometimes it seems as though they didn't really understand the cubism they were trying to emulate, as with Driggs and Demuth's radiating lines in the images reproduced here. But what is clear is the celebration of the newly built––here a bridge anointed with streaming light––and the power of the machine, a romance now long dead. 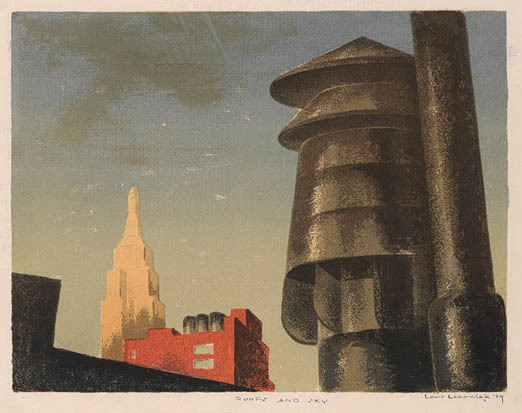 Some American modernists looked around them for subjects, finding interest in land or city, seeing it through eyes tempered by acquaintance with European art. 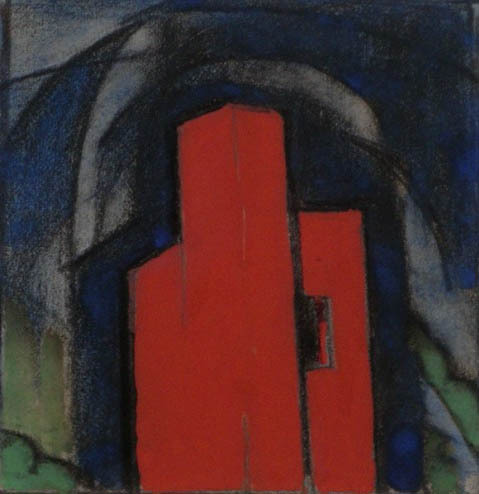 I've always liked the work of Oscar Bluemner, whose paintings are saturated with rich color and made up of geometric, weighty forms. O'Keefe has become such an artistic institution in the United States that it's hard to remember that her work was very avant garde for the time. Her early paintings of New York City are marvelous evocations of light and space, dramatic and claustrophobic, true portraits of the city. These are my ancestors. There is the clarity of space and form, the insistence on the object, in their work that I associate with an American style; these characteristics go back to American Luminist landscape of the 19th century. "What is American about American Art?" is a topic for another day, but I believe these painters took a European style and made it their own, bequeathing to us a great tradition of looking at the modern world through a simplifying lens. Certainly a similarity with the Dove, but what a color change in your photo! That pink and yellow combination is much more late 20th century and still going strong. And somehow pink adds an entirely different feel to the image; not exactly feminine but not so relentlessly male either. I am unfamiliar with Bluemner; that piece is wonderful, including the title. I particularly like your comment "These are my ancestors;" I think all of us who love art and make art, have a group of "ancestors." I agree with you, Linda, that color is now very much intensified from that in the early 20th century. It's curious to me how differently we see color: for me, the color in the photo is red, with light on it, rather than pink. But that may be because I'm familiar with the object. I love the idea of subversive pink, though. And I'm happy to introduce you to Bluemmner, who's a terrific painter. Thanks for echoing the ancestors comment; we are all sums of what has come before, adding our own little portion. enjoyed this tour, Altoon, and esp your photo and the visual sensibility behind it, definitely of this century. how un-scenic it is, for instance, shows how much can be left out of a nature-based composition and still have it hold: it doesn't need anything but itself. thanks for the comment, rappel. I like the idea of the image being self-referential. I hope for that; though the underlying subject matter is important to me, it's better that it's not essential knowledge for the viewer. Wonderful for me to finally read this post Altoon... popped by earlier in the week and without time to absorb. I knew it would be worth returning fresh and ready to be taken somewhere. These artists are pioneers and for that reason alone one wants to linger a little over the works. The O'Keefe vision of the city is very telling. The link to the Armory show is great for those of us from other parts of the globe. I used to hear about it but the full significance of it makes more sense now as my understanding of the US deepens through time - and also visiting blogs which offer glimpses into people's lives and regions coming from all over the country. Australia has such a vastly different heritage, vastly smaller population and resulting layers of story and tension. 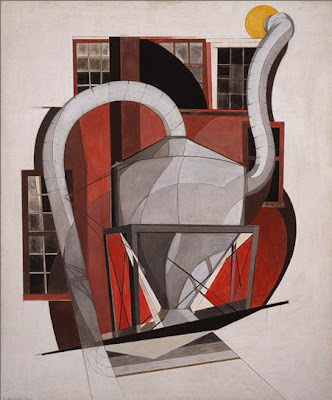 Ive always liked Stuart Davis's work but Demuth did not hit my radar , neither some of the others. Images from film and photography were the most common exports. Old back and white films would show - over many years I have been drawn to watch them. New york was always presented as clanging and loud and gritty and full of rogues - no matter how well dressed! hi Sophie, I'm pleased to introduce you to some lesser known American painters. I remember how excited I was to learn about Australian 19th century landscape painters, especially von Guerard (at the time I was painting landscape)when I visited Australia. There are so many artists to discover, from all over the world. The Armory Show was a young New York City's chance to learn about European artists, and was a major step in its becoming an important art center.